So far, Enbridge’s public and community relations efforts on issues like Northern Gateway and Kalamazoo, have for, the most part, been a disaster. In BC, since the Joint Review hearings wrapped in June, Enbridge has been on a full out campaign to convince British Columbians to support Northern Gateway. Now, at least to me and my geeky sense of humour, it appears, that Enbridge has another PR fiasco in the making. A few minutes ago, as I was scanning my Tweetdeck feed, a Tweet from Enbridge popped up. 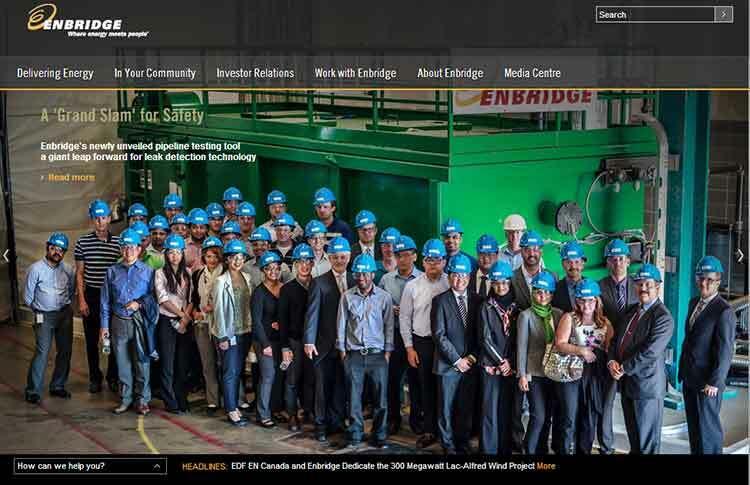 Given that the default background for Tweetdeck is black, I thought, that Enbridge logo looks very dark. Now since I’ve been monitoring Enbridge tweets since I started this site, normally the company logo is white and stands out against the black of the Tweetdeck feed. Is it a mistake I wondered? So I checked the company webpage. It’s a new logo and new web design. In the lead picture, the old logo is clearly visible under the new logo on top. For the record here is the new logo and the old one. The 911 system failed during the 2010 Marshall, Michigan, Enbridge pipeline breach, according to the full report in the incident released by the US National Transportation Safety Board. The NTSB report says the 911 operators in Michigan dismissed eight calls reporting gas or petroleum odours over a period of 14 hours between the initial report of a bad odour and the actual discovery of diluted bitumen polluting Talmadge Creek. The report also says the local firefighters were unfamiliar at that point with potential problems from a bitumen pipeline as opposed to a leak of a consumer natural gas pipeline. Although the NTSB report puts most of the onus on an inadequate Enbridge “Public Awareness Program” (PAP) which failed to familiarize first responders to potential problems, the report raises questions whether British Columbia, especially the north, is properly prepared for all the energy development that is occurring. Whether or not the Enbridge Northern Gateway project proceeds, there are three active and possibly as many as three or four planned liquified natural gas projects for the northwest, ongoing exploration and production in the northeast and the proposed Kinder Morgan expansion in the lower mainland. 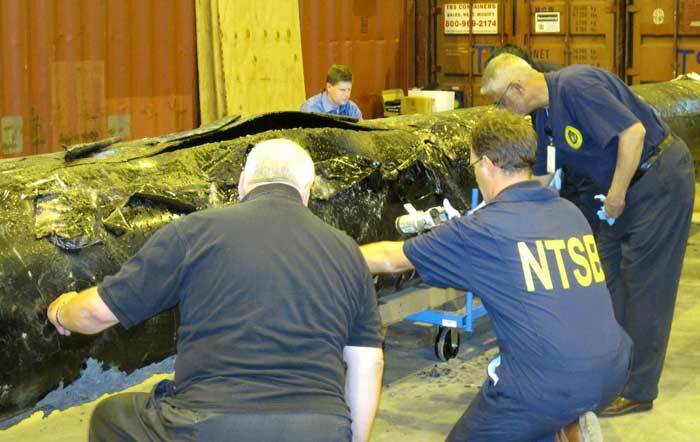 The NTSB says that Sunday, July 25, 2010, at 5:58 pm. EDT, a segment of a 30 inch (7.62 cm) diameter pipeline (Line 6B) operated by Enbridge ruptured in a wetland in Marshall, Michigan. The rupture occurred during the last stages of a pipeline shutdown planned by Enbridge. The leak was not discovered or addressed for over 17 hours, largely due to problems in the Enbridge control room in Edmonton. During the time lapse, the NTSB says, Enbridge twice pumped additional oil (81 percent of the total release) into Line 6B during two pipeline start ups; the total release was estimated to be 843,444 gallons or 3.192 million litres of crude oil. The oil saturated the surrounding wetlands and flowed into the Talmadge Creek and the Kalamazoo River. the airport’s at, and then you can’t smell it anymore. By 9:32 pm., the Marshall City Fire Department had been dispatched in response to the 9:25 pm. call to 911. The 911 dispatcher told the responders there was a report of a bad smell of natural gas near the airport. The responding firefighters were also dispatched. The firefighters checked pipelines and industrial building near the airport. “using a combustible gas indicator” to try to locate the origin of the odour, but did not detect anything. The NTSB says the service technician from Michigan Gas Utilities “crossed paths with some of the fire department personnel” but found no evidence of a gas leak. The fire department personnel departed the scene at 10:54 pm. to return to the station. At 11:33 pm, the area’s 911 system received the first of the seven additional calls when an employee at a business called to report a natural gas odour. to calls in the area, and no more personnel were dispatched. 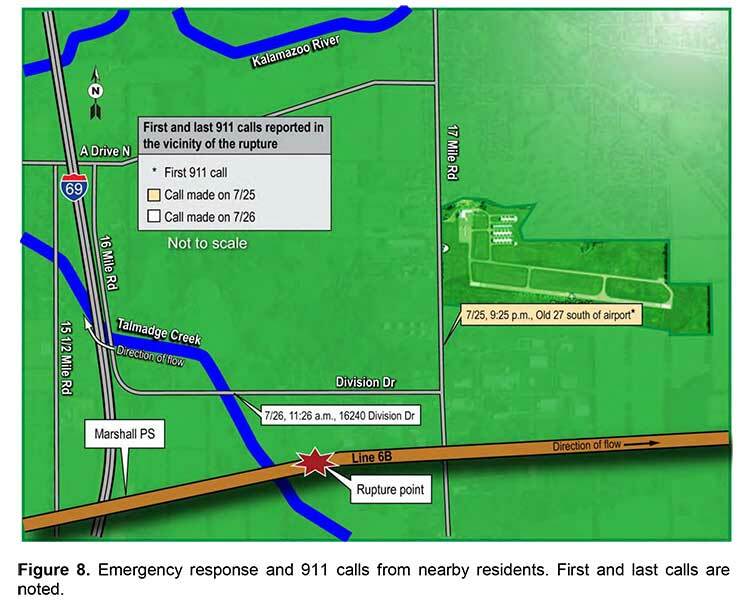 A map of the incident response by the NTSB shows that the area near the airport where the firefighters responded was actually some distance from the pipeline rupture. walk along the pipeline, upstream and downstream of the Marshall pumping station. According to the NTSB, the Chicago regional manager replied, “I wouldn’t think so. If it’s right at Marshall—you know, it seems like there’s something else going wrong either with the computer or with the instrumentation. …you lost column and things go haywire, right?” He went on to say, “…I’m not convinced. We haven’t had any phone calls. I mean it’s perfect weather out here—if it’s a rupture someone’s going to notice that, you know and smell it.” The Chicago regional manager told shift lead C1 that he was okay with the control centre starting Line 6B again. At 11:18 am Enbridge closed the remote valves sealing off the rupture site within a 2.95-mile section. By 11:20 am., the shift lead had called the Chicago regional manager to tell him about the notification. By 11:37 am., another Consumers Energy employee notified 911 about the crude oil leak in a creek near Division Drive. The Fredonia Township Fire Department was dispatched by the 911 centre shortly after the call. At 11:41 am., the Edmonton control centre received confirmation from an Enbridge crossing coordinator located at the Marshall pipeline maintenance shop confirming the oil on the ground. The 911 operators repeatedly informed the callers that the fire department had been dispatched to investigate the issue, but the 911 operators did not contact the pipeline operator or advise the public of health and safety risks. The 911 operators never dispatched the fire department in response to the subsequent calls even though these calls occurred over several hours, indicating an ongoing problem. The actions of both the first responders and the 911 operators are consistent with a phenomenon known as confirmation bias,128 in which decision makers search for evidence consistent with their theories or decisions, while discounting contradictory evidence. Although there was evidence available to the first responders that something other than natural gas was causing noticeable odours in the Marshall area, they discounted that evidence, largely because it contradicted their own findings of no natural gas in the area. Similarly, the 911 operators, with the evidence from the first responders of no natural gas in the area, discounted subsequent calls regarding the strong odours in the Marshall area. Those calls were inconsistent with their own views that the problem causing the odours was either nonexistent or had been resolved. Although Enbridge had provided training to emergency responders in the Marshall area in February 2010, the firefighters’ actions showed a lack of awareness of the nearby crude oil pipeline: they did not search along the Line 6B right-of-way, and they did not call Enbridge. The NTSB concludes that had the firefighters discovered the ruptured segment of Line 6B and called Enbridge, the two start ups of the pipeline might not have occurred and the additional volume might not have been pumped. and respond to a pipeline rupture. Although RP 1162 requires operators to communicate with audiences every 1 to 3 years, Enbridge mailed its public awareness materials to all audiences annually. However, even with more frequent mailings, this accident showed that emergency officials and the public lacked actionable knowledge. transported is critical for successful recognition and reporting of releases, as well as the safe response to pipeline ruptures. The transportation of hazardous materials by pipeline is unlike hazardous materials transportation by railroad or highway because a pipeline is a permanent fixture. A pipeline presents a unique challenge to awareness because it is often buried. When pipeline releases occur, a properly educated public can be the first to recognize and report the emergency. A survey quoted by the NTSB says that of those who responded in the United States. only 23 percent of the affected public and 47 percent of emergency officials responded that they were “very well informed” about pipelines in their community. The NTSB recommends that the International Association of Fire Chiefs and the National Emergency Number Association inform their members about the circumstances of the Marshall, Michigan, pipeline accident and urge their members to aggressively and diligently gather from pipeline operators system-specific information about the pipeline systems in their communities and jurisdictions. In Canada, the National Energy Board, which is responsible for overseeing pipeline operations did inspect the Enbridge control room after the NTSB report. The NEB, of course, has nothing to do with the 911 system. For BC Ambulance the dispatch centre is in Kamloops. Fire departments in northwest British Columbia, so far, have had minimal training in potential pipeline problems, like the fire department in Michigan, enough to detect and deal with consumer and local industrial natural gas systems. It’s clear that the province of British Columbia, if it is going to promote liquified natural gas as a foundation of a new provincial economy, it must plan and budget for a major upgrade to the 911 system, with a new police, fire and ambulance dispatch centre. Enbridge is facing a new penalty from the US Pipeline and Hazardous Materials Administration for not inspecting a pipeline branch in Ohio and Michigan. The decision by the PHMSA comes just after a couple of days after the agency acknowledged that Enbridge had paid the civil penalty for the Marshall, Michigan oil spill with a wire transfer to the US Treasury of $3,699,200 on August 12. 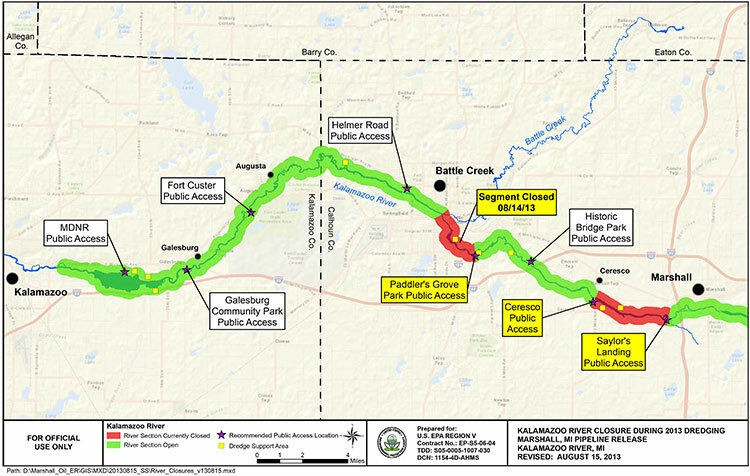 It was the Marshall pipeline breach and spill that led to bitumen entering the Kalamazoo River. The new proposed penalty is much lower, just $68,000. It relates to the PHMSA inspection of Enbridge’s Toledo pipeline between July 12 and July 15, 2010. The PHMSA says it found three alleged violations of federal pipeline safety regulations. 1. Failure to adequately inspect the right-of-way at a mainline valve location in Toledo as required by 49 CFR §195.412. No proposed penalty — Warning Item. 1. Exceeding the maximum interval for inspection of 12 overpressure safety devices as required by 49 CFR §195.428. Proposed penalty is $39,000 + PCO. 1. Exceeding the maximum interval for API 653 internal inspections of two breakout tanks located at Stockbridge, MI as required by 49 CFR §195.432. Proposed penalty is $29,600 + PCO. Enbridge can, if it wishes, challenge the NOPV (Notice of Possible Violation) in court. In the case of the original Marshall, Michigan, spill NOPV, Enbridge did not challenge the findings of the PHMSA and paid the penalty. 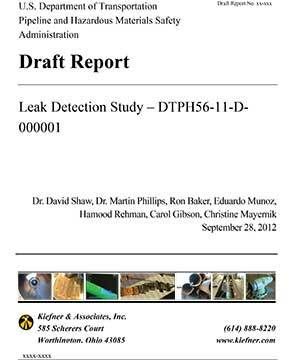 The new document sent to Enbridge by David Barrett, PHMSA Director, Central Region says that the company failed to perform internal inspections or establish a corrosion rate for the bottom plates of its tanks within the 10 year period as required by US regulations. It also says Enbridge failed to demonstrate that they had established a basis for the corrosion rate for the tank bottoms and exceeded the 10 year maximum internal inspection interval for unknown corrosion rates. Additionally, Enbridge did not have similar service experience, or procedures to apply similar service experience available to make this inspection interval determination. The PHMSA also says that Enbridge Enbridge failed to inspect its overpressure safety devices at intervals not exceeding 15 months, but at least once each calendar year. The inspection intervals exceeded the maximum 15 month interval by 14-24 days for the overpressure safety devices listed int the order. each of the tanks and overpressure devices listed in the PHMSA order from 2010 to present. Enbridge has to internally inspect each of the tanks and to submit to the PHMSA documentation on the “safety improvement costs” needed to comply with the order. to the consequences or damages resulting from the Failure.